Elsa has kept a dark secret from her sister Anna. When her secret is revealed in front of the whole town, she is forced to leave her home. While everyone thinks Elsa is an evil witch, Anna believes in Elsa’s good heart. So she teams up with Kristoff to go on an epic journey to find and bring back her beloved sister. 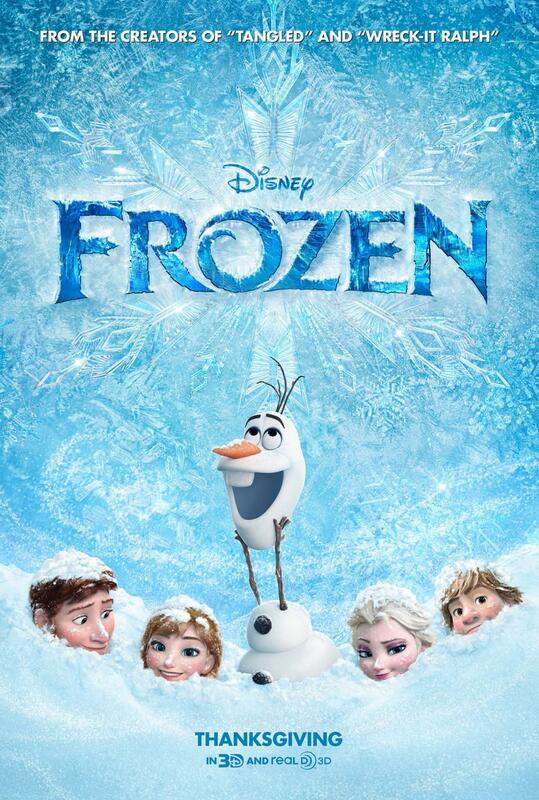 Frozen has a classic Disney – movie structure like I remember from my childhood. Besides a compelling storyline movies, such as Snow White and The Seven Dwarfs (1937), The Little Mermaid (1989), Beauty and The Beast (1991), The Lion King (1994), or Pocahontas (1995) also had a beautiful soundtrack. They were the perfect balance of movie and musical. Since I expected something just as creative and beautiful as that, I have to admit I was a little disappointed when I finally got to see Frozen. The story was cute, but very shallow, which lead to flat characters. I mean, it could have been such an amazing adventure; Elsa could have accidentally iced her own heart and become the evil ice queen, so Anna had to sacrifice herself in order to cure her sister’s heart, and then magically wake up after Elsa’s heart warms up again, because it only took the act of love to save her. They should have added some spice to it, but instead they kept it very dull, and it was actually a little boring. On top of that the songs didn’t really do it for me either. In The Little Mermaid for example each song had a story, one song was about Arielle wanting to become a human, another one was about the pact with Ursula. But the songs in Frozen seemed just added for musical reasons, and frankly, it was a little too much for me. The only song that stole my heart was Idina Menzel’s version of Let it Go. But I already fell in love with her voice in the movie adaptation of he musical Rent. Also, the graphics are brilliant, and the voices they have chosen for the to leading ladies – Kristen Bell and Idina Menzel – were perfect, too. So, all in all, I would say it’s an enjoyable movie, but it doesn’t have the same quality and charm of the Walt Disney classics. Nonetheless it is worth a watch on DVD. And here is the scene that stole my heart: Idina Menzel’s version of Let it Go. It’s my personal highlight of the movie, because the scene itself is breathtaking, too. NO love for Olaf the Snowman?? He stole the movie for me, made me laugh out loud, and is the only reason why I want to own this when it comes out. I didn’t expect that much singing, so when there wasn’t any I enjoyed the movie a lot more. Yes, the singing killed it a little for me… It didn’t always fit in either. Olaf was cute and funny, too! So yeah, SHOUTOUT and LOVE for Olaf! 😀 You are right! This reply made me laugh out loud (mainly the capital letters). Having watched this again over the weekend with friends I realised how awesome he is and I’d rank him behind Wall-e as my second fav animated character of all-time. I recently took my 9 year old son to see this last weekend because he begged me too — apparently they are signing “Let It Go” and “In Summer” in chorus at school…. I really didn’t want to go because I usually can’t stand any recent Disney movie, but I did it because I’ve never gone to the movies with him before (we rarely go, and until recently, he had no desire to)! I think I let all the positive reviews fool me, being a Disney fan I really thought this was gonna be it. But I will still have it in my collection and ready for my future kids to watch! By the way, I think It’s always good to have low expectations! Makes the worst movie a decent experience! Hahah. At least it happened to me before. I bet your son enjoyed it and was singing along! 😀 Too Cute!! Does he know the classics like The Lion King or The Jungle Book? Good review Simon. It’s one of those animated flicks in which anybody can enjoy it if they want to and for that, I have to give it plenty of credit. That, and for also the fact that it’s an absolute stunning animated flick to just gaze at. Thanks for commenting, mister! I get what you say, I agree, it’s definitely a movie parents can watch with their children without leaving the theater being aggravated. Before I watched it I heard comments like “The Best Movie Since The Lion King.” and that’s what made my expectations so much higher and I ended up being disappointed. But I agree that it’s still a good movie.